Winter Projects are Perfect with Winter Food » What's Under the Needle? We all know that winter is a great time to quilt. Staying indoors by a cozy fire, out of the weather is definitely the choice option. 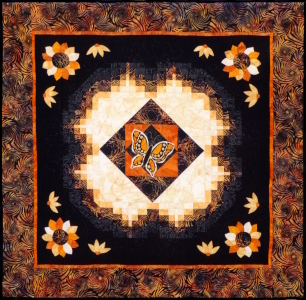 Of course, staying indoors in summer out of the blazing heat is also a perfect time to quilt - in fact, when isn't there a perfect time to quilt? 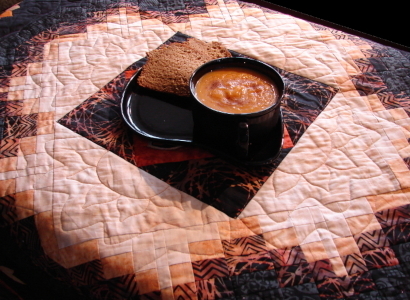 .... but one of the things I love about winter quilting so winter foods and one of my favorite is soup - nothing better on a cold winter day, smelling the soup simmering away as I quilt. My all-time favorite is Pumpkin soup! When I first made Pumpkin soup, I used a basic recipe and then I (in my opinion) perfected it by adding my own personal touch. Today I have decided to share my recipe with you all. The first thing you do is turn on the oven and bake your pumpkin whole. This makes it so much easier to peel and cut. I usually cook mine at around 180 degrees C or 360 degrees F for an hour. After this time, touch the side (protecting your fingers from the heat of course) to see if it is soft. It does not have to be fully cooked through at this stage, just soft enough to cut and peel. If you are cooking half a pumpkin, you can cover the cut portion with tin foil so it doesn't dry out or if it does, peel it off and eat it, yum yum, but leave the seeds in as that will keep the inside flesh moist. Once the pumpkin is baked, cut it open and remove the seeds. Scoop out the pulp and discard the rest. Usually, there is enough to make a double batch! 2 large peeled Kumara (sweet potato) - regular potatoes can also be used, but the sweet potato makes it better! salt and pepper to taste, the more pepper the taster and spicier it gets. I like lots on mine but extra can be added in the top of your bowl if you prefer a less peppery taste. Place all ingredients in a large stockpot and bring to the boil. Lower heat and cook until all veggies are soft and cooked through. Allow to cool slightly and then blend it together. A stick blender works great for this!